The "safety operator" of a self-driving Uber car was watching TV just before the vehicle was involved in a fatal collision, a police report reveals. The Uber car struck and killed pedestrian Elaine Herzberg, 49, of Tempe, Arizona in March. The police report suggests the car's driver was streaming an episode of talent show The Voice rather than monitoring the car's progress. It suggests she could face charges of vehicle manslaughter. 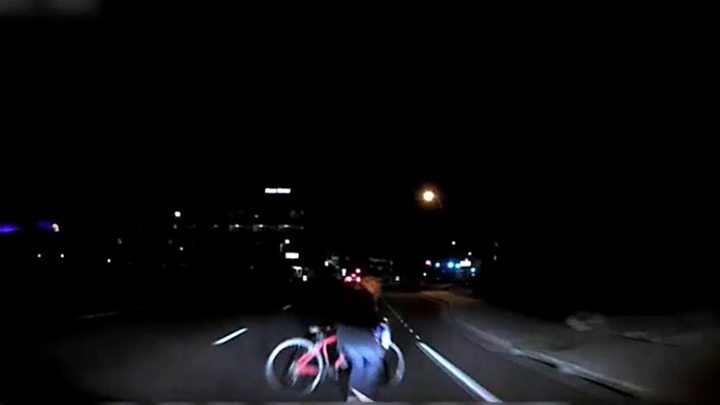 The Tempe police report said the crash was "entirely avoidable" if the Uber operator, Rafaela Vasquez, had been watching the road while the car was operating autonomously. In its experiments with driverless cars, Uber has mandated that a human operator pays attention at all times so they can take over in difficult situations or when the vehicle encounters a situation it does not know how to handle. Ms Vasquez looked up from her phone screen about 0.5 seconds before the crash, said the report, but had been concentrating on her phone for about 5.3 seconds previously. At the time, the driverless Volvo car was travelling at 44mph (70km/h). In a statement, Uber said it was "cooperating fully" with the continuing investigations while it did its own internal safety review. It added: "We have a strict policy prohibiting mobile device usage for anyone operating our self-driving vehicles. We plan to share more on the changes we'll make to our program soon." The Tempe police report comes less than a month after a preliminary investigation into the crash was released by the US National Transportation Safety Board. This revealed the Uber car had about six seconds to react after spotting Ms Herzberg crossing the road in the dark ahead of it. The car "failed" to identify Ms Herzberg as a pedestrian, it found, and took no action to avoid hitting her nor did it perform an emergency stop.